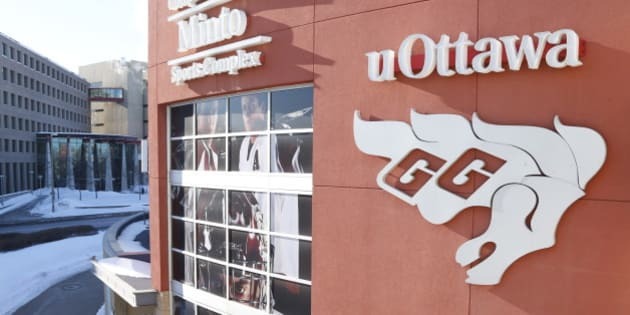 OTTAWA - The University of Ottawa and its president, Allan Rock, face a class action lawsuit over the suspension of the school's men's hockey team in connection with a sexual assault investigation. The legal proceeding was launched Tuesday in Ontario's Superior Court of Justice by lawyer Lawrence Greenspon — an alumnus of the university — on behalf of student Andrew Creppin and 21 other members of the varsity hockey team. Two students who were on the team were charged last summer with sexually assaulting a female student at Lakehead University in Thunder Bay in February. The two are not part of the class action. Almost a month after the alleged incident in Thunder Bay, Rock suspended the entire hockey team for the season. The court filing, which seeks $6 million in damages, is necessary because the university wrongly tarnished the reputation of every member of the 2013-14 hockey squad, Greenspon said. "It was launched against the University of Ottawa for the way they treated the members of that 2013-14 men's varsity hockey team," Greenspon told a news conference. "We seek to have all of the 12013-14 players, except the two that have been charged, certified as a class in order to pursue the University of Ottawa for damages caused to the team members." Creppin, one of the players, is currently the only one with his name on the lawsuit. He said Tuesday that others on the team preferred not to face the scrutiny that would result from going public. But with his hopes of hockey stardom all but dashed following the suspension, Creppin said he wants to clear his name to ensure there are no questions about his ethics as he pursues a career as a chiropractor. Creppin, who is studying human kinetics, said he and other team members have been under a cloud since the suspension was announced. He said he and some other players were at the Thunder Bay hospital with an ailing teammate at the time the sexual assault was alleged to have occurred. The school wouldn't comment on the lawsuit on Tuesday, saying it had yet to see the court filing. "The University of Ottawa has not yet been served with any documents relating to a legal action on this subject," said Caroline Milliard, the school's media relations manager. "We will review any legal documents when they are served." Many of the students who were suspended and are represented by the lawsuit have been forced to apply to other universities in order to continue playing hockey, said Greenspon. "It hasn't been easy for any of them," he said. Two of the suspended players, Guillaume Donovan, 24, and David Foucher, 25, both of Gatineau, Que., were each charged last August with one count of sexual assault. The alleged assault involved a 21-year-old female victim and allegedly took place in a hotel early on Feb. 2, police said. But authorities were only informed of the incident on Feb. 25, when a third party came forward with a complaint. The case has been in the legal system ever since. On Tuesday, a Thunder Bay criminal court judge held the case over for another month as the lawyer for one of the accused awaits additional evidence from prosecutors. The university also conducted its own internal investigation, but Greenspon said the investigator's report has not been made public, or provided to the suspended students. The internal inquiry resulted in the firing of head coach Real Paiement. Rock acknowledged in June that innocent team members were being tarred by the scandal. "The shadow cast by the allegations of misconduct has affected all members of the team, some unfairly,'' he said at the time. The university later said it would rebuild its men hockey program, hire a new coach and implement new behaviour guidelines. The class action lawsuit, if certified by the superior court, could take years to be settled.